I’ve been keeping busy with sewing projects because Mom and I went to the Sewing Show in Abbotsford last weekend. The show was smaller than other years but still enjoyable. There wasn’t anything new there from last year but I did pick up a couple of patterns and a book. 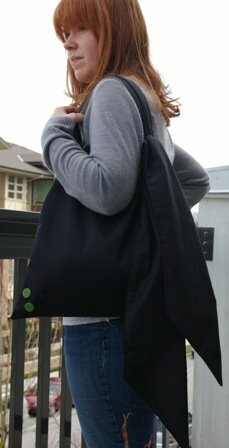 One of the patterns I picked up was the Swing Bag by Amy Butler. We went down to Opus yesterday so that I could buy some duck canvas, which lines the bag. I used left over fabric for the rest that I have left from other projects. I had some buttons laying around that were left from other projects so I added them on. The sash should be another 10″ long but I was running out of fabric, so it’s not long enough to tie it in a bow – or I’m not patient enough!